Once upon a time there was an attorney named Mr. Ballantine. He lived in the spacious gracious days of the nineteenth century. Mr. Ballantine didn't know they were spacious and gracious. He thought they were terrible. The reason he thought they were terrible was that love had passed him by. Mr. Ballantine had never received a valentine. He said to his partner, My name is Mr. Ballantine and I have never received a valentine. His partner said, Well my name is Mr. Bogardus and I have received plenty of valentines and I just as soon wouldn't. He said Mr. Ballantine didn't know when he was well off. Mr. Ballantine said, I know my heart, I know my mind, I know I long for a valentine. He said here it was St. Valentine's day and when he sat down at his desk what did he find? I find affidavits, said Mr. Ballantine. That's the kind of valentine I get, said Mr. Ballantine. Mr. Bogardus said that affidavit was better than no bread. Mr. Ballantine said that affidavit, affidavit, affidavit onward, into the valley of death rode the six hundred. Mr. Bogardus said that any many who would rhyme "onward" with "six hundred" didn't deserve any affidavits at all. Mr. Ballantine said coldly that he was an attorney, not a poet, and Mr. Bogardus had better take the matter up directly with Lord Tennyson. Mr. Bogardus said Oh all right, and speaking of lords, he couldn't remember who was the king before David, but Solomon was the king affidavit. Mr. Ballantine buried Mr. Bogardus in the cellar and went out in search of love. Towards evening he encountered a maiden named Herculena, the Strongest Woman in the World. He said, Madam my name is Mr. Ballantine and I have never received a valentine. She said, My name is Herculena the Strongest Woman in the World, and I have never received a valentine either. Mr. Ballantine and Herculena decided to be each other's valentine. All was merry as a marriage bell. Mr. Ballantine nearly burst with joy. Herculena nearly burst with pride. She asked Mr. Ballantine to pinch her muscle. Mr. Ballantine recovered consciousness just in time to observe the vernal equinox. He thought she said bustle. Published in 1938, Samantha posted this wonderful Nash verse on her blog, Perched in the Search . She discovered the poem in "I'm a Stranger here Myself" which was cherished by her grandparents and handed down to her. 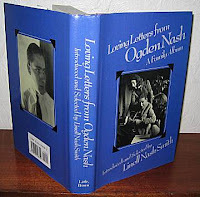 If you'd like to learn more about Ogden Nash's lifelong valentine read 'Loving Letters from Ogden Nash'. Hello. My name is Kimberly Stickrath, and I have been following your site for some time. I wanted you to know that I have nominated your site for The Sunshine Award , which is a blogger-created award, given to those whose "Positivity and Creativity Inspire Others." Thank you for your kindness in sharing your site with me. Hi Kim, Thank you for your support and kind praise. Your recognition of Ogden Nash's positive influence is aligned with how Nash wanted his work to impact others. Ever the teacher, even when Nash wrote gripes and satire, he still was very much focused on creating positive change.